For a free consultation, call 423-378-3100. We are based in Kingsport, Tennessee. We provide 24 hour assisted living at our beautiful place on East Stone Drive. We also come to your home and provide help. We are trained, experienced, and insured. Not only do we provide help to the individual who may need personal care but also to the caregiver who may need a break or help with something they can’t do alone. We charge $20 an hour for our At Home services however, we sometimes have sponsors that help with those costs and we offer discounts for extended use of our services. Our Assisted Living care at our 2424 East Stone Drive location provides care at $4.45 an hour (or $3.50 an hour – companion room) and this includes, room, nutritious meals, entertainment, medication reminders, transportation to medical, entertainment, and shopping. The social interaction, good food, and having medical help nearby not only prolongs life but improves the quality of life. If you need assistance with personal care including eating, toileting, continence, dressing, bathing, and moving about you will qualify for financial assistance whether that assistance is provided at your home or at our location. We can also help with the necessary forms to obtain that assistance. 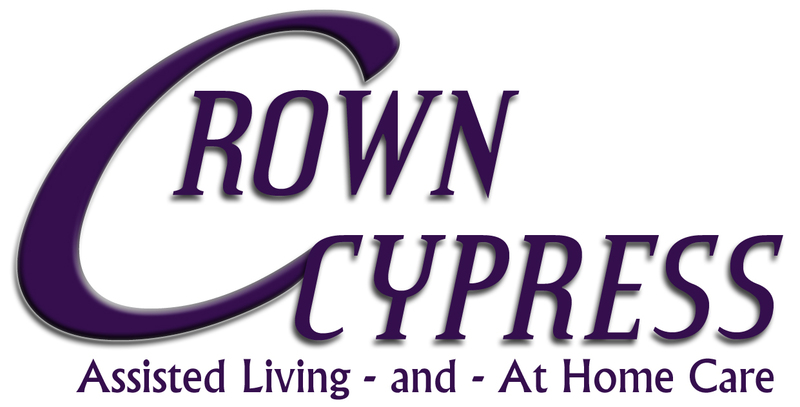 Crown Cypress staff love working with people. It is what we do and we do it well. We hope you will let us help you and your loved ones.